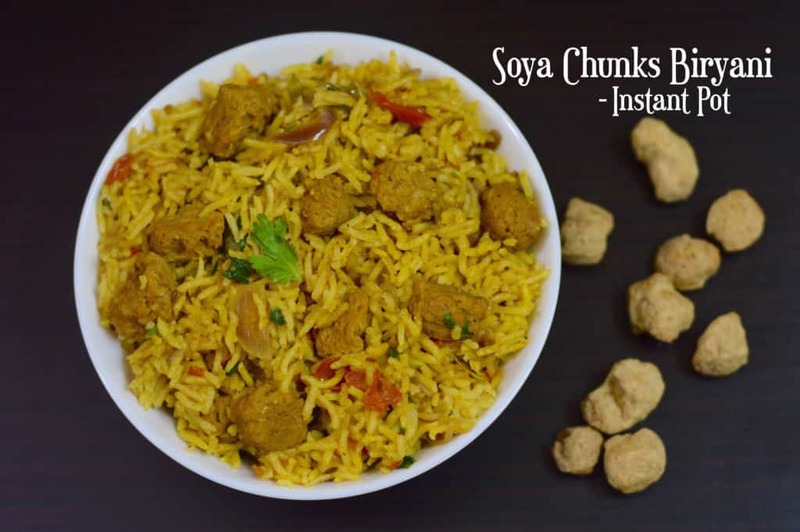 Soya Chunks are rich of Fiber and Protein along with Carbohydrates. 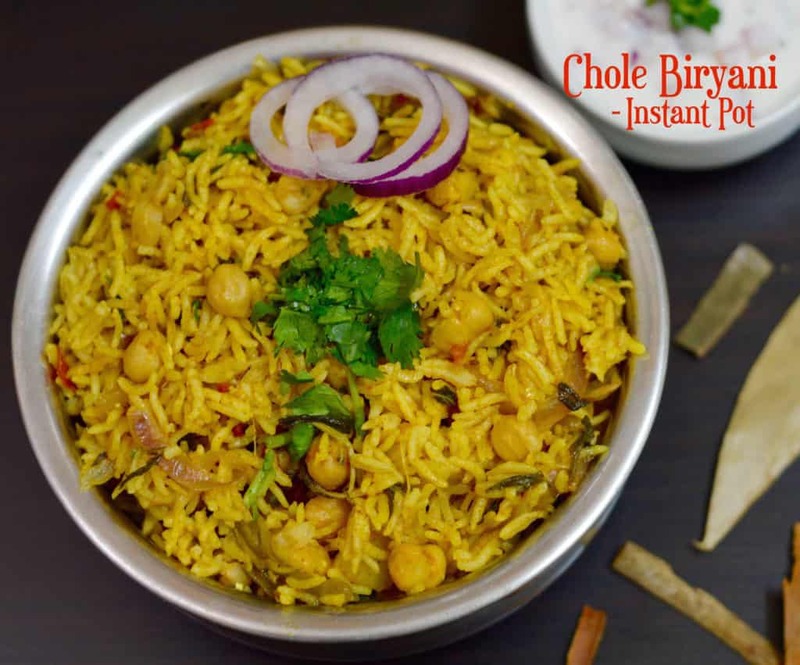 This great soya chunks biryani is a one pot dish perfect for all occasions. 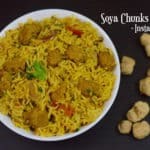 You can buy Soya Chunks from Amazon. Take some Hot Water in a bowl and add salt. Take 1 Cup of Soya Chunks and Soak it in the hot water for 15 minutes.Keep aside. Press SAUTE mode on Instant Pot. Add oil or ghee and once it's hot add Bay leaf,whole spices,Jeera/Cumin,green chilly. Saute for 30 secs. Add sliced onions,ginger-garlic paste.Saute for 2-3 minutes until they turn soft and light brown in color - stir regularly. Then add Mint leaves,tomatoes ,cook till tomatoes are soft. Add yogurt/curd,turmeric powder,biryani powder,garam masala and give a quick stir. Add soaked soya chunks(squeeze excess water) and cook for 1-2 minutes. Keep stirring else masala paste may get burnt. Add washed Basmati Rice,water,salt and give a stir . 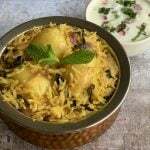 Soya Biryani is ready.Serve with Raita or plain yogurt. In a Pressure cooker heat oil or ghee and once it's hot add Bay leaf,whole spices,Jeera/Cumin,green chilly. Saute for 30 secs. Add sliced onions,ginger-garlic paste. Saute for 2-3 minutes until they turn soft and light brown in color - stir regularly. Cover the cooker with lid and cook for two whistles on medium flame. After 10 mins Fluff up the rice gently.garnish with coriander leaves. 1.Vegans can skip ghee and use any kind of vegetable oil. 2.Vegans can skip yogurt and add juice of half lemon. 3.You can use any vegetables of your choice like green peas,carrot,green beans along with soya chunks. 4.You can increase or decrease spice accordingly. 5.You can also do a Quick Release(QR) once the Pot beeps if you less time. 6.You can also Mix together soya nuggets,water and salt in a bowl and cook in the microwave for 2-3 minutes to save more time. 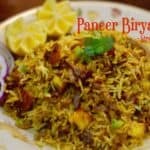 2 tbsp Biryani Masala Powder i used MDH hyderabad biryani powder note:reduce biryani powder if you want less spicy. First boil basmati rice and keep it aside. Heat oil in a pan add onion slices, cook until golden brown in colour ,appx takes 8-10 minutes. In the same pan,add oil,turmeric powder,ginger garlic paste, red chili powder and salute for 1 minute. Then add green chillies, chopped mint, coriander powder, yogurt,biryani masala powder ,and stir well for another 2-3 minutes. Add fried paneer, squeeze lime juice,salt and add boiled basmati rice toss it . Cover the lid and let it steam for 2 minutes, then switch off the flame. 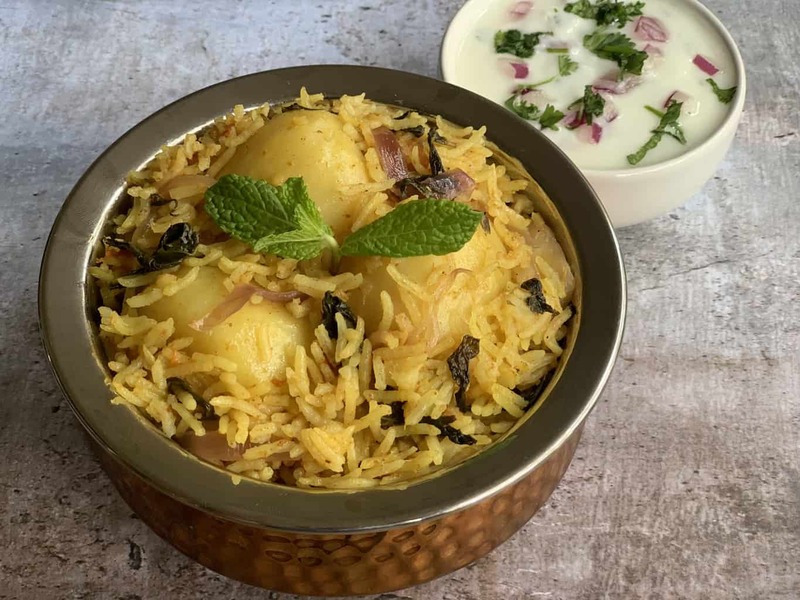 Garnish with coriander & serve hot paneer biryani with raita.